As already mentioned Lara Pulver is again playing stage-shy Louise who transforms into seductive stripper Gypsy Rose Lee and joining Imelda Staunton as her battling stage mother Rose, in the highly acclaimed Chichester production of musical Gypsy Rose Lee when it transfers into the Savoy Theatre in March. Kevin Whately, who played agent and suitor Herbie at Chichester, can’t make the London transfer because he has to film Lewis. Peter Davison, the former Doctor Who who has extensive TV credits and has appeared in West End musicals including Spamalot and Legally Blonde, will take the role. 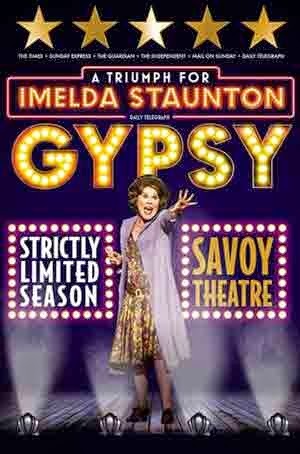 Producers Michael Harrison and David Ian are currently finalising the rest of the cast for the Savoy with rehearsals starting next month.